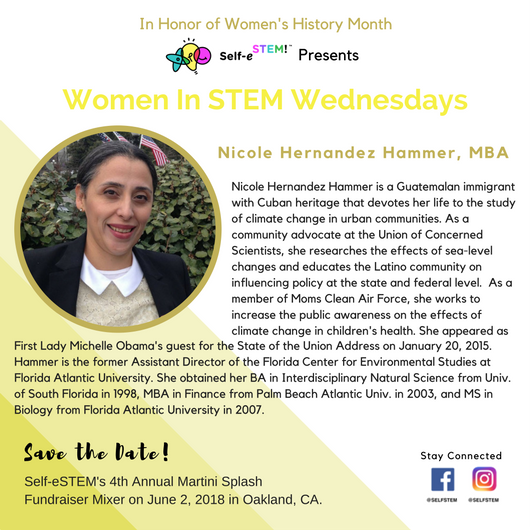 Nicole Hernandez Hammer is a Guatemalan immigrant with Cuban heritage that devotes her life to the study of climate change in urban communities. As a community advocate at the Union of Concerned Scientists, she researches the effects of sea-level changes and educates the Latino community on influencing policy at the state and federal level. As a member of Moms Clean Air Force, she works to increase the public awareness on the effects of climate change in children’s health. She appeared as First Lady Michelle Obama’s guest for the State of the Union Address on January 20, 2015. Hammer is the former Assistant Director of the Florida Center for Environmental Studies at Florida Atlantic University. She obtained her BA in Interdisciplinary Natural Science from Univ. of South Florida in 1998, MBA in Finance from Palm Beach Atlantic Univ. in 2003, and MS in Biology from Florida Atlantic University in 2007.